Definition at line 49 of file clip.h. Definition at line 204 of file clip.c. 216 * current modelview matrix and stored in the resulting eye coordinates. Definition at line 227 of file clip.c. Definition at line 798 of file clip.c. Definition at line 756 of file clip.c. Definition at line 902 of file clip.c. Definition at line 283 of file clip.c. 295 * We use 6 instances of this code to clip agains the 6 planes. Definition at line 262 of file clip.c. Definition at line 458 of file clip.c. Definition at line 116 of file clip.c. 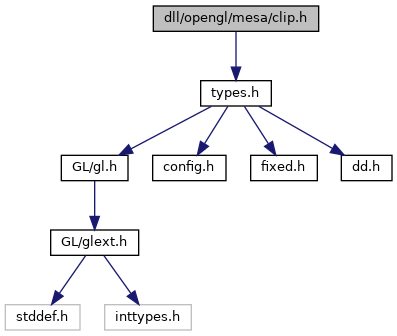 Referenced by gl_userclip_line(), gl_userclip_polygon(), and update_clipmask(). Definition at line 190 of file clip.c. Definition at line 163 of file clip.c. Definition at line 179 of file clip.c.